Doyle garden wall lantern in a black gold finish. A well-made traditional design wall light for use on an outdoor wall or in a porch area. 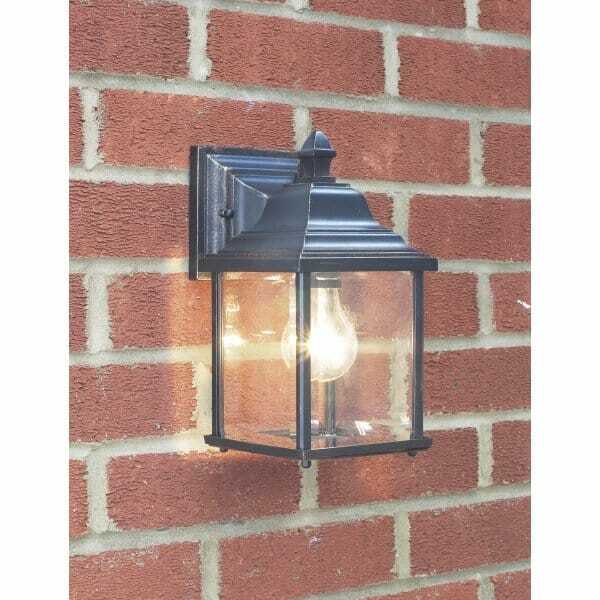 The lantern is manufactured in cast aluminium and has a 5 year guarantee against corrosion (does not apply in salty or acidic conditions) and is rated for use outside (IP44). Reminiscent of an old carriage light, this downward facing garden wall light would be an ideal choice for a period property. The wall lantern has clear bevelled polished glass panels which will allow the maximum light through. Can be used with either a standard or a low energy bulb. The fitting is double insulated.